Yesterday, I finally broke down and took my first Capital Bikeshare trip. I'd purchased a membership through the LivingSocial deal this past April, but I have yet to activate it. Part of my delay is that I just haven't had situations where CaBi would have been useful...pretty much every time I'm in the District, I'm either in my car, on Metro, or using my own bike, and then using my own two feet to get in between if needed. But yesterday, an opportunity presented itself for me to test out CaBi, both to see if my membership would be worthwhile, and also since Nice Ride MN uses the same Bixi bikes in Minneapolis. I did one round-trip, from 5th and K NW up to 10th and U NW, then vice versa after a late lunch. Using the kiosk to obtain the bike was pretty straightforward. I followed the touchscreen, swiped my credit card, got my unlock code, and printed my receipts. The only problem or potential problem I saw would be if someone tried to read all 101 pages of the user agreement on the touchscreen. Perhaps there's a better way somehow for CaBi to provide the user agreement, or at least the main points, without trying to flip through that many pages on a small screen. Riding the bike wasn't difficult and was fairly easy to get peddling. The brakes felt soft, but still worked as needed. Though I had the seat at the right height, I felt like I was leaning way forward during most of the ride...not sure if raising or lowering the seat further would have solved that. Docking the bike at the destination was easier than I had been led to believe. The gear shift was probably my biggest hang-up on the trip. On at least 3 occasions, I was instinctively pushing the shift forward to shift into 3rd gear, but this shifted the bike back into 1st gear instead. Having only 3 gears was slightly disappointing as well. I tend to bike fairly fast and, especially on the return trip, there were places where having higher gears available would have come in handy. The return trip was simpler than the initial trip. Because I was already in the system, I only had to swipe my credit card and get my unlock code. I also got lucky in that, while the 5th and K station was pretty full, there were still 2 open docks available. And my bike got used by someone else less than a minute after I arrived. All in all, it was a positive experience. The bike took some getting used to, but it got me from Point A to Point B with little fuss. I can easily see situations where CaBi would be useful...if it's too far to walk, or if someone is making a short hop (2 miles or less) and doesn't want to deal with Metro or a bus, or if the destination isn't near Metro but has a CaBi station nearby. One overall concern deals with helmets. Unless one intends on riding CaBi or plans for the possibility (as I did), the lack of a helmet for some rides is a safety concern. 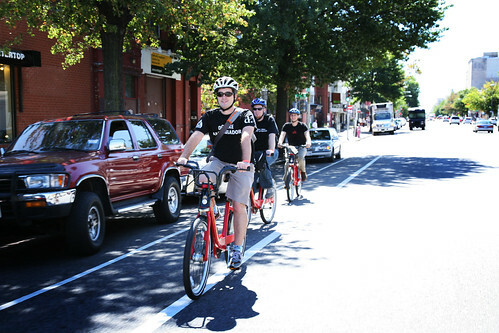 Still, CaBi is a worthwhile addition and I'm looking forward to seeing it expanded, especially to Alexandria. And during rush hour (5pm) to boot. VDOT decided to close the Route 1 path connector to Washington St/Mt Vernon Trail/Wilson Bridge, in order to do maintenance on the light poles on the bridge over Cameron Run. This in-and-of-itself isn't necessarily a bad thing, but they chose to do it during evening rush hour, when there are a fair number of people bicycling home to Huntington along the path. Nevermind that it prevented being able to count bikes and pedestrians this evening as part of the National Bicycle and Pedestrian Documentation Project. There was just barely enough room to squeeze by the trucks on a bicycle, and I doubt the workers even noticed me, but to "follow the rules" here put a big inconvenience on bicyclists and pedestrians using the connection. Neither of the two possible detour routes is particularly safe, and both add additional distance that is longer than the connection itself. The somewhat-safer/more-likely of the detour routes, to the south around Belle Haven Country Club, adds a mile-and-a-half extra distance (a full 30 minutes for the average pedestrian), has segments along both Fort Hunt Rd and Belle Haven Rd that lack shoulders and sidewalks, and involves a dangerous, unsignalized crossing of heavy rush-hour traffic on George Washington Pkwy. If VDOT really needed to shut down the path, so be it. 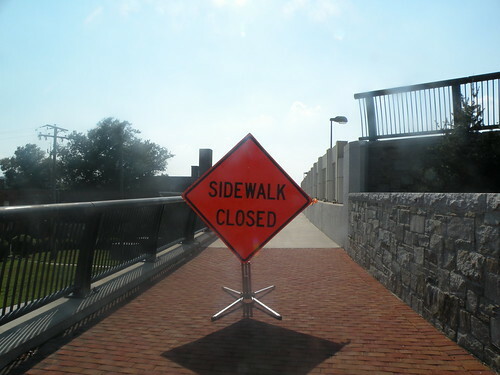 But do it during mid-day, when you're affecting the fewest possible path users. They wouldn't close down a highway ramp during rush hour for normal maintenance...why close down a bike/ped path with no decent alternative?